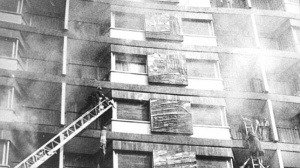 The Corona de Aragón Hotel Fire changed the fire protection regulations in Spain. Now, the victims of that fire have insisted on investigate this event where 79 people died. They demand a judge to decide whether the fire was by chance or caused. For that reason, the lawyer of the victims, Pedro Cerracín, now prepares a brief that will present in the next days. The victims have denounced that the fire was not caused by chance at the cafe in the hotel. They say it was a terrorist attack because it coincided with the presence at the hotel of some members of the Military Academy and also Carmen Polo, the widow of Franco who was in there. There have already been five attempts to reinvestigate it for murder and terrorist fire. The National Court reopened the case in 2013 and the judge Andreu decided to stop it in June of that year because the State Security Forces replied to his request that they had no enough data on the claim of the alleged attack. That is why, he indicated that “no new data has been produced that guarantees that the commission of the facts was carried out by a terrorist organization”.